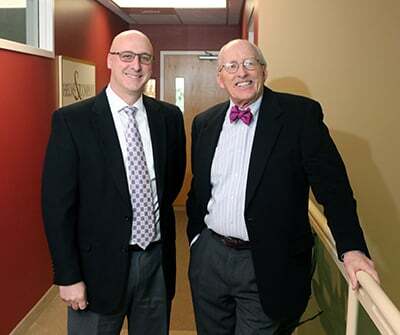 Roland Lamy and Mike Degnan of Helms & Company at their Concord office on Pillsbury Street. “We had a folding card table and a princess phone in a small office on Main Street,” said Mike Degnan, remembering the day — Oct. 1, 1983 — he and his partner, Ned Helms, opened Helms & Company, a healthcare consulting and management firm. Thirty-five years later, Helms & Company is the preeminent healthcare consultancy in New Hampshire. Its clients run the gamut from the largest of the acute care hospitals to the smallest of the home health agencies in the state, and everything in-between. “We have relationships with every for-profit and not-for-profit healthcare institution — hospitals, physician practices, mental health centers, nursing homes, and so on — in the state,” said Degnan. The firm conducts about two-thirds of its business in New Hampshire and the balance in Vermont, Maine and Massachusetts, with annual billings of about $2.5 million. The Helms-Degnan partnership began at the NH Department of Health and Human Services, where Helms served as commissioner and Degnan as chief information officer. With his term set to expire in 1984, Helms decided against seeking reappointment while Degnan had taken a job at Wang Laboratories. Initially, Degnan split his time between the company and Wang before joining the company full-time in 1985. He has served as its president since 1994, when Helms left to join Blue Cross-Blue Shield of New Hampshire. Roland Lamy, also a veteran of DHHS (he was assistant director of health planning and Medicaid) succeeded Degnan in January. Altogether, the company has grown to include six principals and four senior consultants supported by an administrative team of four. The team has deep roots and strong ties to New Hampshire, where all of the principals completed some or all of their education as well as spent some or all of their professional careers. At the outset, the state’s certificate of need (CON) program kick-started the business. The program required healthcare providers seeking to enter the state or expand their operations to gain approval from state regulators on the presumption that healthcare costs could be controlled by limiting excess capital investment in either facilities or equipment. Introduced in 1979, as hospitals responded to both unprecedented population growth and advancing medical technology, the program was a boon to the fledgling consultancy. “We did the research, wrote the applications and shepherded the clients through the process,” Degnan said. Moreover, the CON process prompted the company to initiate several joint ventures that enabled hospitals to share the cost of expensive medical technology. Degnan explained that initially three hospitals applied to install the then new technology of fixed magnetic resonance imaging (MRI) units, but when mobile units appeared, Helms & Co. formed and managed a consortium — New Hampshire Imaging Service — to acquire and share the technology among hospitals on a rotating basis. Following this model, a mobile lithotripter, for treating kidney stones, was put in service in 1986 — just the second in the country — and a mobile positron emission tomography (PET) unit, a scan for tumors, began operating in 2002. In 1990, the company cemented its longstanding relationship with community mental health centers by drawing nine of them into a partnership with four hospitals to form the Behavioral Health Network Inc., a for-profit corporation owned by not-for-profit providers offering managed behavioral health, substance abuse and employee assistance services throughout northern New England. Degnan, who served as CEO, said that the network “was a very successful model” and posted annual revenues of $25 million prior to being acquired by Anthem in 2006. For one, Lamy serves as executive director of the NH Community Behavioral Health Association and the firm administers the organization, Pritchard said. “They’ve brought us to where we might never have been,” she said. “They are well-versed on public policy and upcoming issues, both nationally and locally.” She said that the company has assisted her agency and others in preparing strategic plans, introducing and refining programs, addressing business problems, and designing and negotiating payment systems. Lamy said that business falls primarily into several “buckets” — administering joint ventures and professional associations, managing physician practices, providing executive support and interim management, and developing strategic plans and business solutions for hospitals and other providers. The company also administers state programs overseen by the NH Insurance Department, including the NH Health Plan, which assesses health insurance carriers to subsidize the cost of premiums in the marketplace created by the Affordable Care Act and expansion of Medicaid. Likewise, the firm manages the vaccine pool, which also assesses insurance carriers to fund the distribution of vaccines, especially to children. Kevin Smith, one of the principals, manages the Home Care, Hospice and Palliative Care Alliance, a consortium of home health and hospice care agencies with more than 40 members. Smith said that the ongoing acquisition of physician practices by hospitals represents a significant development in the structure of the healthcare industry, marked by the disappearance of private practices and the employment of doctors by hospitals. Developing these affiliations, negotiating these transactions and overseeing these relationships, he added, has been a growing share of the consulting business. Lamy said he expected much of the work in the future will involve the community behavioral health centers and the rural critical access hospitals, which represent the core of the firm’s business. The community behavioral health centers, where a disproportionate share of clients are covered by Medicaid, have long wrestled with the financial pressure arising from among the lowest reimbursement rates among the 50 states. At the same time, relatively low wages and high turnover rates have left agencies shorthanded amid an unusually tight labor market. “A lot of good work has been done, but there is a lot more to do,” Lamy said. Many of the 13 critical access hospitals, those with no more than 25 beds and no closer than 35 miles to another hospital — most in the northern reaches of the state — also care for disproportionate shares of patients enrolled in Medicaid and Medicare. As the population continues to age at a rapid pace, government reimbursements will represent an increasing share of their revenue and opportunities to shift costs will diminish, adding to their already significant financial challenges. Lamy said he fears that the decision of Lakes Region General Hospital, one of the largest north of Concord, to curtail maternity services, which it provided at a loss, may be a precursor of measures to limit services at even smaller rural hospitals. He stressed that beyond providing healthcare, especially 24/7 emergency services in remote areas, these hospitals serve as social and economic anchors of their communities, among them some of the most hard-pressed in the state. “We have enjoyed a history of successful collaboration with both the behavioral health agencies and the small rural hospitals from the very beginning, which we expect to continue,” Lamy said.